I'm blogging! I can hardly believe it myself. It's been a whole year since I've written a post. I'm not certain whether I'll be back often or not, but I've listened to all of your sweet replys on Instagram and I'm going to at least try to get back to this space to record the bigger crafting events of my life. And if there was ever a 'big' crafting event, this is one. This quilt is FOUR YEARS in the making! It was 100% inspired by this beauty by the talented Aneela Hoey. I decided this was the perfect opportunity to cut into my stash of Denyse Schmidt fabrics and use all of her lines in one quilt - which at the time was just Flea Market Fancy, Katie Jump Rope and Hope Valley. I love how they all work together. You can find a great Spiderweb tutorial here. This quilt is pretty big - about 60 x 72. Originally I had intended on making it big enough for our king sized bed but honestly I ran out of steam and just decided that finished was better than ginormous. Plus I really wanted to quilt it myself. I went for an echo of the stars on the background fabric and a big loopy flower motif on the spiderwebs. My quilting is far from perfect but I'm getting better and gaining more confidence with every quilt. I love, love, love this quilt. Definitely one of my favorites I've made to date. The moment I saw this quilt in Alexia Abegg's new book Liberty Love, I knew I would have to drop everything to make one. The quilt is called the Marcelle Medallion and it just has such a fun, fresh feeling. I'd been craving a new design with some challenging piecing that would enable me to delve deep into my stash, and this pattern fulfilled all of those needs. I've seen some other gorgeous versions with really original color schemes, but honestly I was so in love with Alexia's version that I didn't stray too far from the colors of her quilt. I had a ball stash-diving for prints old and new, brights and neutrals, Japanese treasures, beloved Liberty and favorite designer cottons. This quilt really got me to cut into my ever-growing cream and white stash too. Please don't be fooled into thinking I used a lot of scraps for this quilt - I actually cut into many fat quarters and yardage for the first time. The center star is a bit tricky with it's set in seams but from there it's pretty easy. And fun! Lots of triangles, flying geese and crosses. One of the toughest parts is choosing the border fabrics - especially that really thick one. I'm very happy I went with the Tsuru print. The only major changes I made to the original quilt was to add the two outer scrappy borders. The inner bright borders was just comprised of 5.5 inch squares and fit perfectly. Then for the outside border I cut random lengths of 2.5 inch wide neutrals and added corner squares in a Liberty print. Just in time my backing and binding fabric arrived! I'm still trying to figure out how to quilt this one. I want to do something that will be worthy of the design and challenge me without screwing it up! I'm getting more and more confident with my free motion quilting skills and this I'm sure will be another great one to practice on! If you'd like to see some more gorgeous, inspiring versions of the Marcelle Medallion, be sure to pop over to Instagram and search under hashtag "medallionalong". Oh hi! Yep, I'm still here. And if you're still coming despite my lags between posts, thank you. I've been sewing just a little bit every day, but between a very active toddler and a pre-schooler who isn't wanting to nap these days, time is precious. So I get a little lazy with the blogging and do most of my daily WIP sharing on Instagram. I have been feeling quite productive the last few weeks and now I have a new, shiny quilt to show you! When Liberty of London released their first-ever quilting cotton line, Bloomsbury Gardens, it was love at first sight. I've been a Liberty fan for awhile now so this was just a dream come true for me. I ordered a gigantic half yard bundle of the stuff, and while it was a true splurge, I'm still glad I did because these prints feel right at home in my stash and lots of patchwork projects. I haven't been feeling much of an urge to stitch up 'one designer line' quilts lately, but I had to make an exception here. The colors and prints in this line are so vibrant and beautiful I knew I wanted to set them off with pure Kona white for a more classic touch. The block I used, though sometimes looks like a pinwheel, is just a simple hourglass. You can find a great tutorial for the block on Ayumi Mills blog. This quilt is pretty big, I think around 75x75, and the blocks are just 4.5 inches, so it was a lot of piecework. Chain-piecing was my friend here. I quilted this one on my own and I must say I think I'm more proud of this work than any quilting I've done yet to date. Once again I used a design from Angela Walters Free Motion Quilting - I've been getting a lot of bang for my buck with that book! This time I used the Paisley design. Luckily it was fun to do because it did take me nearly six hours to complete over the course of a week. I went with good old plain white for the back too, and I'm glad I did because the quilting pops. So that's that. I'll see you here again soonish with my Marcelle Medallion! The Japanese x & + block can no longer be denied. I've been dreaming of making one of these quilts for a whole year and the sheer joy of the Scrappytripalong has gotten me to fall more deeply in love with scrap quilts than ever. This first block just sort of made itself yesterday afternoon. And let me tell you, they are just as addictive as the scrappy trip blocks. Or that my Scrappy Trips top is hanging out just begging to be basted, quilted and bound. The first four blocks have been made and a gigantic pile of scraps have been pulled. And so it looks like our new informal interweb quiltaverse sewalong has been born! You can find us under hash tag #xplusalong on Instagram and there is a new Flickr group too. Please come over and play, whether you are just starting out or want to finish the blocks you started when it became a sensation last year. You can also find Amy Badskirt's fabulous tutorial for the block here and the original beauty by Setsuko Inagawa that started it all here. and what a trip it's been! I can hardly believe how this pattern his taken the online quilting community by storm! It's been wonderfully amazing to see all the gorgeous Scrappytripalongs pop up all over Instagram, Flickr and the blogaverse. They have all been so different and unique, and I love how this quilt really expresses the individual personality of each quilter - so much so that I could easily pick the creators of many of them out before even knowing who made it. And this is my finished top. I think it is totally 'me'. I am pretty much smitten with the chaos here and I think it is going to be a great companion to my Scrap Hoover quilt. This one started out as a scrap bin buster, but soon I ran out of scraps big enough for the pattern. After that, I raided stash. I love how this is a blend of scraps I may not have otherwise used and many of my most treasured prints. I'm just awaiting an order for some backing from Pink Castle Fabrics (Brenda, if you didn't know, was one of the other original firestarters of this whole craze!) and then I will be quilting this one myself. I'm thinking big swirls, but we'll see. I want to thank each and every one of you who has jumped on this Scrappytripalong! As fast as this quilt is to make, given my track record for speed this would've taken me weeks to complete if it hadn't been for all of you inspiring and encouraging me along. So what do we make next? I didn't really mean to do it, but I started a new quilt this week. I have a zillion WIPs I should finish, but the stress of the holidays and the big finish of my Swoon and Field Study quilts made me cave. And I've been longing to start another super scrappy quilt. This design has been on the front of my back burner for almost a year now after seeing this one and this one and this one. As soon as I began, I was possessed. These blocks are addictive! And apparently contagious, too - suddenly everyone is making a Scrappy Trip Around the World! Katy, Rita, Lindsay and Brenda are all making one - Brenda has even started a Flickr group. There are also rumors that Amber, Ashley, Heather, Laura, Dana and too many more to name are joining in! I'll be posting my pics on Instagram too. 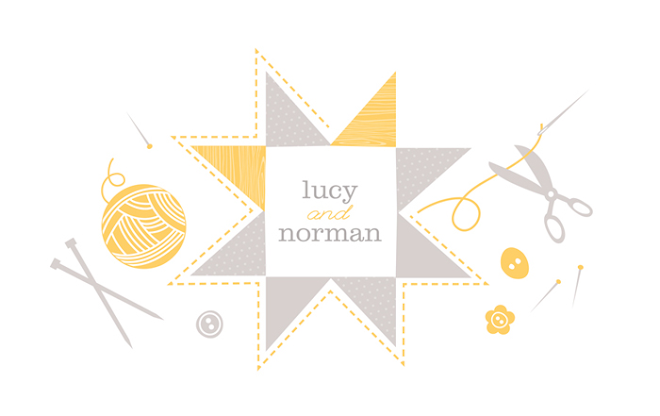 I'm lucyandnorman there if you'd like to follow me. I used the tutorial over here. It's easy, a ton of fun and so satisfying to use up all this scrappage and stashage. Obviously I'm going as scrappy as possible but specific color combinations are pretty too if this is too wild for you. But I've got a stash to bust so scrappy it is for me. I hope to see you over on Flickr and IG. And Happy New Year to all - let's send 2012 out with a scrappy bang! Is it really almost Christmas???? This year has gone by entirely too quickly. I haven't accomplished near the amount of quilting I would've liked but I did finally finish my Swoon! Though the only reason that happened was because it needed to be done in time to gift for Christmas. I'm taking a risk posting it in case the recipients are lurking around my blog, but I'm just too excited not to share it with you now! Of course you've seen a million finished Swoons by now and there is nothing terribly unique about this one, but it did turn out beautifully if I do say so myself. I used an old collection from Amy Butler called Belle that I had buried deep within my stash. I think the large-scale prints and bright colors play well with the Swoon block. And I know you are all wondering about the absolutely gorgeous quilting, right? This was done by none other than the fabulously talented Krista Withers. Krista's work is breathtakingly inspirational. We decided on a simple baptist fan pattern for this one just like the original Swoon. I will be bribing Krista soon to do some free-style on my hopefully soon to be finished Colorwheel Spiderweb. So that's my Swoon! It will be a bit difficult to part with but I know I can still visit it. I hope you are all able to find a bit of time to relax during this hectic season - I know I'll be glad when all of my ninth hour crafting is done. I guess I had better get back to that. I'll have my finished Field Study Diamond quilt to show you soon.